The America’s Cup challenger Stars & Stripes Team USA, has released additional details outlining their boat build and design process. As part of the team’s strategy to learn from industry experts, Stars & Stripes purchased a design package for their AC75 race yacht from Emirates Team New Zealand which immediately placed the team in a competitive position with respect to the boat build and design process for AC36. That package included a complete design for the team’s first AC75 that is currently under construction, a design identical to ETNZ’s boat one. Stars & Stripes also has the option to purchase an additional basic design package for their second boat that can be modified with the team’s final race performance enhancements (AC36 teams are restricted to building only two AC75’s). Throughout the build and design process, the design package also allows their designers to learn from the ETNZ design team, the same team that developed the revolutionary foiling monohull concept. Using this platform as a starting point, the Stars & Stripes design team, led by J B Braun, has been able to focus on innovative performance solutions to improve upon the design package in areas including appendage design, software, and sail design, amongst others. Recent hires to that design and build team are; Senior Engineer Alon Finkelstein, who joins the team after 15 years with Farr Yacht Design and 3 years with Oracle Racing, and Lead Construction Manager Dennis Gunderson from Maine, who has versatile project management experience in the boat building industry from classic yachts to carbon fiber super yachts. Also joining the team as Performance Analysis Machine Learning Lead, is America’s Cup veteran Bryan Baker who brings a robust background in computational fluid dynamics modeling and performance prediction to the design team. Stars & Stripes have also entered a design partnership with the North Technology Group to supply sails and design resources. This is spearheaded by Braun, who in addition to his role within the team, also serves as the director of design and engineering for the world’s leading sailmaker. 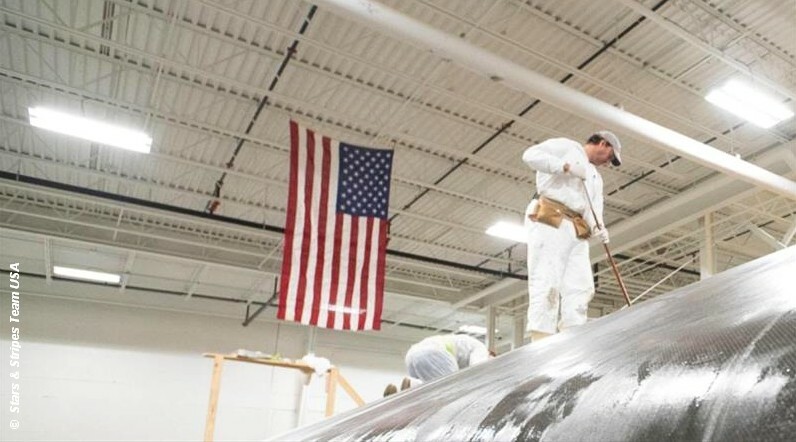 Stars & Stripes have now confirmed that they are building the team’s AC75 at Composite Builders in Holland, Michigan and that they have retained Tim Smyth to advise on the build. Brian MacInnes, founder and CEO of Composite Builders said that they have brought together over twenty American boat builders for the AC75 build. Stars & Stripes will soon be announcing details around the application and tryout process for American athletes and support personnel wanting to be part of the team. American boat builders and those interested in apprenticeships are encouraged to apply.